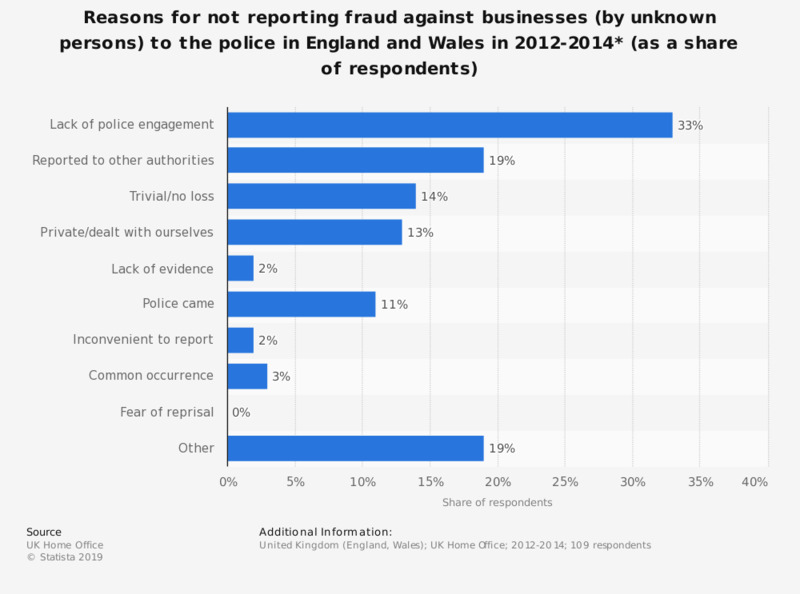 This survey shows the reasons businesses gave for not reporting cases of fraud by unknown persons to the police in England and Wales in 2012/2014. Of respondents, 33 percent said they did not report the incident due to lack of police engagement, such as believing the police could not have done anything, would not be interested or had not done anything in the past. * Data is based on responses from across 6 industry sectors: agriculture, forestry and fishing, wholesale and retail trade, accommodation and food services activities, arts, entertainment and recreation, manufacturing and transportation and storage industry sectors. Data for manufacturing and transportation and storage sectors was collected in 2012 and data for "Arts, entertainment and recreation" was collected in 2013.